"Decades ago, Sturnheim was a thriving trade town on a major caravan route. But then, disaster struck when a gold-laden caravan disappeared without a trace. Financially ruined, the town slipped into decline, and now lies almost forgotten on a route that is seldom traveled anymore. 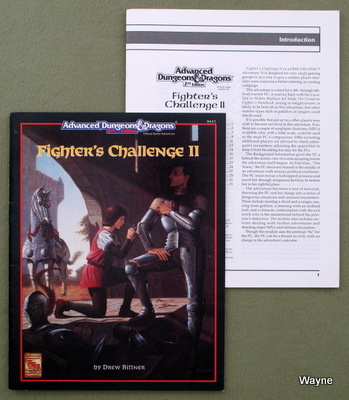 Fighter's Challenge is a new type of ADVANCED DUNGEONS & DRAGONS adventure. It is designed especially for a Dungeon Master and one player - perfect for very small playing groups, for those times when the whole group can't get together, or for the player who wants his character to earn some extra experience. This adventure will provide hours of excitement for the DM and any warrior or multi-class fighter character of levels 2 to 4." "The village of Northbank was once a haven for mages of all talents and a magnet for hopeful apprentices. Its wizards' guild was a respected center for instruction, study, and research. But mysterious circumstances caused the sudden demise of the guild several years ago and resulted in the deaths of some important guild members. And a ghostly figure now threatens the few surviving members of the guild. 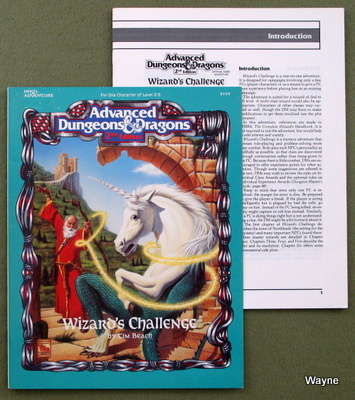 Wizard's Challenge is an ADVANCED DUNGEONS & DRAGONS adventure designed for a single character or a party of up to three members. It allows a wizard to be the center of the adventure and offers many role- playing oppurtunities such as spell research, component gathering, and forging important relationships with other wizards. This adventure is perfect for the wizard who needs experience, is looking for something more than crawling through dungeons, or is seeking a student or mentor." "For years, trade and travel along the river Thadysh have been peaceful. Suddenly a masked renegade, known only as the Gullwing Bandit, has turned the waters of Thadysh into a pirate stream! Who is this bandit? What nefarious plot is he weaving? Not even the local thieve's guild has been able to unveil the truth. 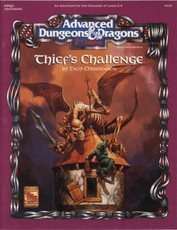 Thief's Challenge is a special ADVANCED DUNGEONS & DRAGONS adventure designed for a DUNGEON MASTER and one player character: a thief. It's a perfect break from group play, tailored to the character who's seeking some extra experience. Suited to clever beginners as well as more experienced rogues, Thief's Challenge lets a thief take full advantage of his special talents." "Pommeville is a sleepy little town that seems like a good place to stay for the night. That is, until the town's dead rise from their graves and begin terrorizing the village! Ancient evil threatens to overwhelm the good folk of Pommeville unless someone can find a way to comfort the restless dead. A lone, player character cleric will have to be clever, courageous, and more than a little lucky to solve the mystery and save Pommeville from the mindless zombies that threaten it! 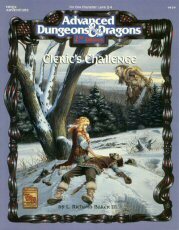 Cleric's Challenge is a special ONE-ON-ONE ADVANCED DUNGEONS & DRAGONS adventure designed for a DUNGEON MASTER and one player - perfect for very small playing groups, or for the player who wants his or her character to earn some extra experience." "The kingdom of Tramilar was once a powerful state. Now, disease and dissent have left the kingdom weak. The Dreadwoods on the kingdom's northern border are a haunt for evil creatures and plots. Discord stalks the very halls of the king. Only the bravest and most dedicated warrior could overcome the obstacles hidden in the forest and lurking in the throne room. 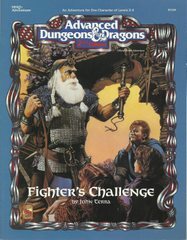 Fighter's Challenge II is a special ONE-ON-ONE ADVANCED DUNGEONS & DRAGONS adventure designed for a DUNGEON MASTER and one player - perfect for very small groups, for those times when the whole group can't get together, and for the player who wants his or her character to earn some extra experience while playing the role of a knight errant. Can you survive the horrors of the Dreadwoods? Are you ready to face treachery and deceit in high places? Adventure and danger await around every bend in the trail!" "There is trouble in the frontier town of New Haven. A beast from the badlands is terrorizing the simple farmers, and reports say the creature is immune to the local militia's weapons. The baron of the land has called upon a wizard to solve what his soldiers could not. Can the skills of one player character wizard let him find and kill what a contingent of skilled warriors could not? 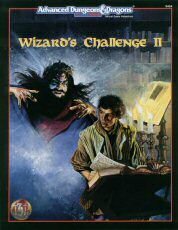 Wizard's Challenge II is an ADVANCED DUNGEONS & DRAGONS adventure designed for a Dungeon Master and one player character wizard. 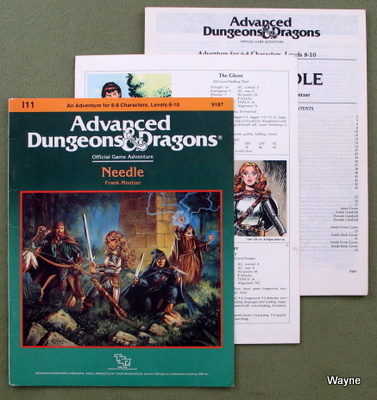 This adventure is the sixth in a series of adventures focusing on an individual character away from a regular campaign. A character will need all of the knowledge and skills available only to a wizard if he is to succeed." This is the only TSR product (I'm aware of) written by Terry Amthor, better known for his prolific work for ICE: Middle Earth Role Playing (MERP), Rolemaster, and more. "Looking for oppurtunity and fresh pickings, a rogue hops a ship for new lands, only to leap from the frying pan into the fire. The ship is attacked on the high seas by a band of blood-thirsty pirates, and the rogue washes up on the Isle of Beacon Point...right at the center of the pirate's sphere of influence. Can this single character stay alive with no more than wits and hard-earned thieving skills, escape the island, and possibly even bring down the pirates? 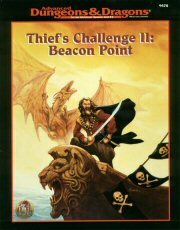 Thief's Challenge II: Beacon Point is a special ONE-ON-ONE ADVANCED DUNGEONS & DRAGONS adventure designed for a Dungeon Master and one player character thief of levels 4 to 6. It is the seventh in a series of independent adventures focusing on an individual character of a specific class." "Something evil is stalking the parish of Barlox. Ten years ago, the village's temple burned to the ground and the parish priest disappeared. The temple has since been rebuilt, but life has not returned to normal. A current of fear and discontent now ripples beneath the surface of this once sleepy wine-making community. Old rivalries have turned bitter, and unwittingly unleashed a force of ancient corruption. 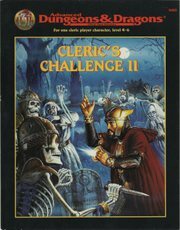 Cleric's Challenge II is a special ONE-ON-ONE ADVANCED DUNGEONS & DRAGONS adventure designed for a Dungeon Master and one player character cleric of 4th to 6th level. It is the eighth in a series of independant adventures focusing on an individual character of a specific class." "Somewhere in the heart of the steaming jungle lies the answer to the whispered tales - rumors of a magnificent city and foul, horrid rituals! Here a brave party might find riches and wonders - or death! Is your party brave enough to face the terrors of the unknown and find - the Forbidden City! 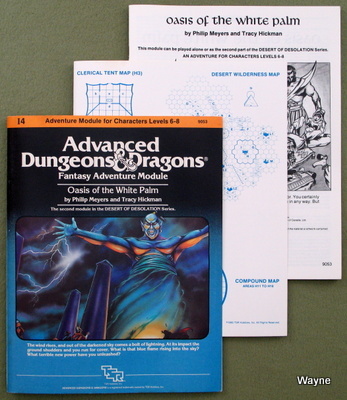 Parts of this module were used in 1980 for a major East Coast convention tournament. Information is presented here to reconstruct this exciting tournament and even more has been given to expand play. Here characters may adventure several times in a unique and interesting mini-campaign. Included in this module are background and tournament notes, referee's keys, new monsters, pre- generated characters, and eight different maps." 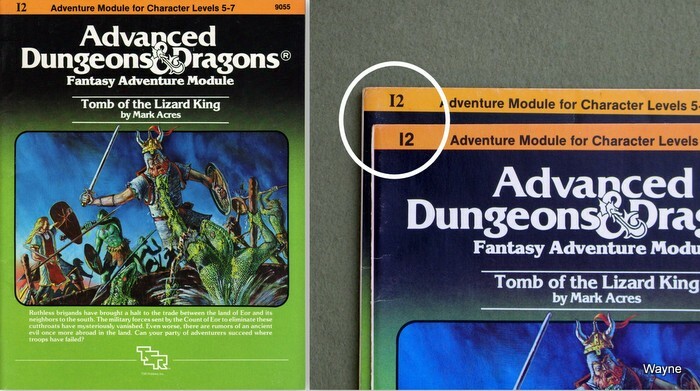 The letter/number code on the original printing looked too much like a "12", so later prints were given a serif font "I" in the "I2" module code. "The southlands of Eor are being despoiled. Merchants will no longer run their caravans on the main highway past the quiet village of Waycombe. The peasants are fleeing their lands, and all are demanding protection from the powerful Count of Eor. The goodly count has sent a troop of his trusted fighters to exterminate the brigands believed responsible for these outrages, but weeks have passed, and still there is no word from this force. Now John Brunis, Count of Eor, has turned to you for aid. After taking counsel with the High Priest of Eor, he believes that a small party of cunning, bold adventurers may succeed where armed might has failed. You find yourselves faced with many mysteries! Why has robbery suddenly erupted in the peaceful southlands? How could mere brigands be as powerful as the foes described to you by their numerous victims? Is this really mere robbery? Or is there some truth to the rumors, told only in hushed whispers, about the beginnings of a hideous plot being hatched by an ancient, vile and evil foe of all mankind? The answers to these mysteries will be found by only the most brave and cunning in this extremely challenging adventure for characters levels 5-7." See our blog for a rundown of the different color interiors of I3. Also, take a look at the ultra-rare Daystar West edition. "Your skin was blistered all day before the hot desert sun sank slowly below the horizon. Now, the deep blue mists of the desert night swirl about you in the wind. The cool night air seems to soak up the heat of the endless desert sands. You shiver as you and your friends huddle around your campfire, glancing nervously at the giant pyramid in the distance. There is an eerie and mysterious feeling about that place. Gradually, the winds change direction, carrying a thin streak of white mist that swirls into the shape of a faceless man dressed in ancient robes. The moonlight seems to shine through him as he raises his arms towards the pyramid and speaks. "I am Pharaoh Amun-re, son of Takosh-re of the House of Mo-pelar. I am now only a shadow who has walked these sands for a thousand years in search of wise and mighty warriors to break into my pyramid and plunder my tomb." The winds shift again; his robes begin to swirl about him and he fades back into the mists and winds. 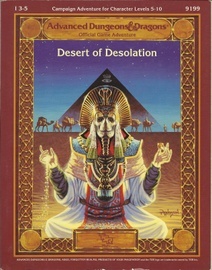 Why does this desert spirit want you to plunder his tomb? Can you survive the challenges of a pyramid that has stood for a thousand years? Or are you being led into a trap?" "Tired and sore, you struggle over the burning sands towards the long-forgotten city. Will you reach the place in time to save yourselves from the evil Efreeti? The sun beats down, making your wounds stiff and worsening the constant thirst that plagues anyone who travels these waterless wastes. But there is hope - are those the ruins over there? A hush falls over the ruins, making the back of your neck prickle. Then, out of the east, a wind rises, gentle at first but quickly growing stronger and wilder, until it tears at your clothes and nearly lifts you off your feet. The once clear sky iis choked with white and grey clouds that clash and boil. As the clouds blacken, day turns to night. Lightning flashes followed by a menacing growl of thunder. You are beginning to wonder if you should seek shelter, when all of a sudden there is a blinding crash and a bolt of lightning reduces the statue to dust. For a moment, silence. Then, out of the statue's remains, soars a blue flame. Its roar deafens you as higher and higher it climbs, until it seems about to reach the clouds. Just when you think it can grow no larger, its shape begins to change. The edges billow and soften, the roar lessens, and before your eyes materializes a gigantic blue man." "Your sleek cloudskate skims across the Skysea. It is midnight. All day long the glass sea soaked up the scorching desert sunlight. Now, that heat lifts your ship a few inches off the glass and fills its sails. The only sound you hear is the soft swish of the diamond-edged rudder as it cuts a path across the Skysea. One thousand years ago, the wizard Martek knew that you would come to find his sphere of power. Now, one of his glowing Star Gems shows you the way. The starlight, reflected in the glass benearth you, flickers peacefully. Suddenly, the Skysea before you bursts up into a thousand shards of splintered glass, showering into the moonlight! A horrible creature is silhouetted against the moon. You strain against the rudder to keep your ship upright. Too late! Your cloudskate tips onto one runner, and then tumbles over, skidding to a stop on the glass. As your companions struggle to right the ship, you turn to face the monster. You must hold the creature back to give them time. Without the ship, none of you can get off the glass before the sun rises in the morning. Martek's prophecy spoke of heroes, tests and dangers. Are you the heroes? What are the tests? What dangers and riches lie ahead?" This supermodule was issued with both a map booklet and a large poster-sized color mapsheet of individual maps seperated by dotted lines. The mapsheet was often cut up for play and is frequently missing from used copies in the marketplace. "An epic adventure includes the revised Desert of Desolation series plus totally new adventures within Raurin, a desert wilderness set in the fabulous Forgotten Realms. Deep blue mists of the night swirl over the sands of Raurin, the incomparable Desert of Dust. As the cool night air drains the heat from the sand, you and your friends huddle around your campfire, glancing nervously at the giant pyramid in the distance. Gradually, the winds change direction, bearing a thin streak of white mist toward you from the pyramid. It swirls and takes shape as a faceless man dressed in ancient robes and an ornate head-piece; moonlight shining through his ghostly body and robes, he lifts his arms toward the pyramid and speaks. It was magic that conveyed you all to Bralizar, and an ancient map that guided you through the pass in The Dustwall. But it was, after all, the tales that finally brought you to this place - tales of endless wealth, of spirit-guarded pyramids, of crystalline obelisks, of gemstones with mysterious properties. Now, as the haunted voice of the spectre before you begins his tale, you wonder if the treasure and the quest are worth the price...perhaps your very lives. Are you really the heroes of the prophecies, those who will overcome the foretold tests, and those for whom the treasure awaits? It is time to search your hearts before you venture further into the Desert of Desolation." 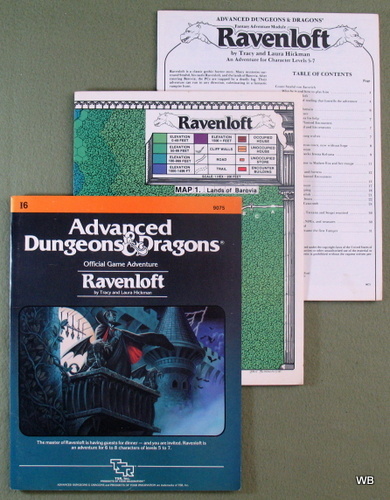 In 1999, TSR released two different reprints of the classic I6 Ravenloft module. 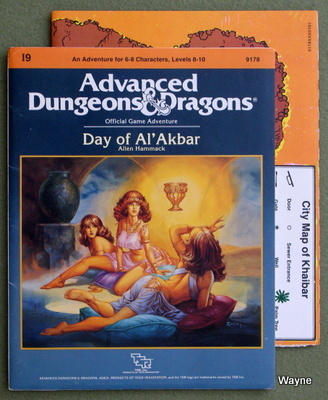 One was almost a straight reprint of the original, with a Silver Anniversary medallion in lower right corner and color changes to interior maps. It was found exclusively as a part of the TSR Silver Anniversary Collector's Edition box set. 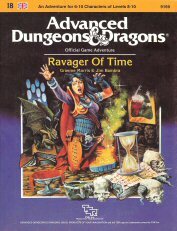 The other was titled "Silver Anniversary (25) Ravenloft" (TSR 11397) and revised for 2nd Edition AD&D. "Under raging stormclouds, a lone figure stands silhouetted against the ancient walls of castle Ravenloft. Count Strahd von Zarovich stares down a sheer cliff at the village below. A cold, bitter wind spins dead leaves around him, billowing his cape in the darkness. Lightning splits the clouds overhead, casting stark white light across him. Strahd turns to the sky, revealing the angular muscles of his face and hands. He has a look of power - and of madness. His once-handsome face is contorted by a tragedy darker than the night itself. Rumbling thunder pounds the castle spires. The wind's howling increases as Strahd turns his gaze back to the village. Fas below, yet not beyond his keen eyesight, a party of adventurers has just entered his domain. Strahd's face forms a twisted smile as his dark plan unfolds. He knew they were coming, and he knows why they came, all according to his plan. He, the master of Ravenloft, will attend to them. Philip originally gave this module the title "Demon's Beacon," but TSR made him change it, because of the satanistic connotation. We got quite a laugh about that. "A strangely delivered advertisement has led you to a sage named Demetrios. He needs a rare component to complete a desperately needed potion. The journey to retrieve it will take you through a large, unexplored swamp to a ruined keep, the former headquarters of a vile cult that once claimed the lives of many innocent youths. 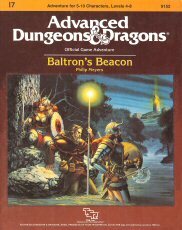 To solve the mysteries of Baltron's Beacon, the characters must excel in handling wilderness, building ruins, dungeons, traps, puzzles, and new monsters. This adventure, originally designed for tournament use, is now available for your own campaign. An Adventure for 5-10 Characters, Levels 4-8." There are 8 pages of separately-numbered ("PULL-OUT SHEET" I through VII) handouts in the center, bringing the actual page count to 32 pages. "So this is the Ffenargh? Mile after mile of stinking bogs overlain by a swirling mist that clings to the skin and chills to the bone. Ahead, a decrepit causeway rises scant inches above the fetid waters and meanders its way through the twisted forms of stunted trees into the depths of this forsaken land. For years, these blighted fens have been ignored by the outside world, but now an urgent summons brings you into the Ffenargh, to the Court of the Lords Spiritual at Eylea. A foul murder has been committed. Geoffrey D'Arcy, Lord of Myrkfast, has been slain by his own son and you are called upon to find out why. Death has always hung heavy over this mire, but now an ancient evil has returned to haunt the mist - an evil whose icy fingers reach out to crush any who dare delve its secrets. You who have faced death a thousand times, meet it now in ts most terrible guise. Can you defeat it, or will you fall victim to the Ravager of Time?" "The land of Arir - a once peaceful desert country, dotted with oases, teeming with caravans - fell into the hand of infidels. The ruler, the dearly loved Sultan Amhara, was killed in the battle for the capital city of Khaibar. He left behind one of the greatest treasure stores ever amassed - jewels and coins, more than anyone had ever seen before or since - and in addition, the Cup and Talisman of Al'Akbar. A deadly plague sweeps your land. The holy men say that if only they had the Talisman, they could create cures for this dread disease. 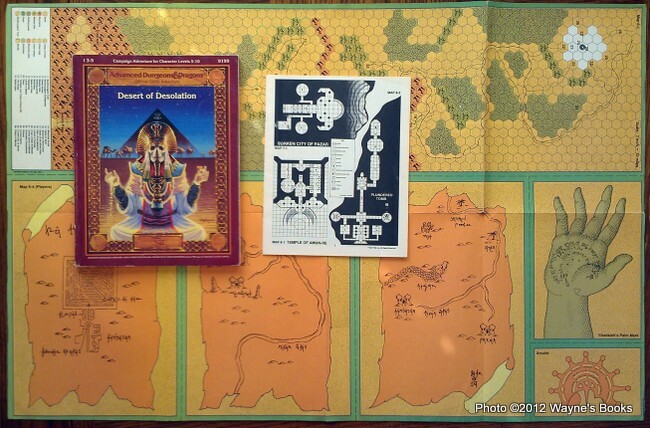 Many adventurers have tries and failed to find the Cup and Talisman. Now it is your turn. Find these treasures, and save your people! The journey is exciting, but treacherous. Do not be distracted by exotic sights and sounds, the strange foods. You must avoid being discovered by Al'Farzikh and his brigands, as you infiltrate the palace. Be wary - what is most beautiful may be most deadly, and what seems useless may be priceless." The master of Gryphon Hill bids you welcome and hopes that you have a pleasant stay. Please forgive him if he does not greet you, for he is rather involved in a little experiment at the moment. No doubt he will call upon you when your services are required. 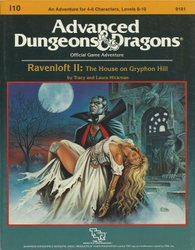 Ravenloft II: The House on Gryphon Hill is an adventure of romance and dark mystery for the ADVANCED DUNGEONS & DRAGONS® game system. It is recommended for characters of 8-10th level in parties of 4 or more player characters. It is highly recommended that at least one of these be a cleric. Gryphon Hill is the sequel to a previous adventure module, I6 "Ravenloft." This adventure can be run independently from that previous work ... however, those who own the original Ravenloft will find a special trick or treat. Appendix 3: The Dream of Barovia gives directions on how to combine both of these modules into an even greater, fantastic adventure. The adventure is divided into Chapters and an Epilogue. The adventure is further divided into Events and Encounters. Events are occurrences which are dictated primarily by time and may occur anywhere. These provide the general flow of the adventure and a sense of the story unfolding. Encounters are occurrences which are dictated primarily by location. These describe and give occurrences triggered when the PCs enter a specific location. The objective of the game is to find and destroy the vampire Strahd and to rescue those who have fallen under the control of evil. Whenever, if ever, this happens, go immediately to the Epilogue. It is your responsibility as the DM of this game to use every power available to Strahd to stop the player characters before this happens." "The king's notice asked for adventurers to undertake a mission to a far land. It was marked with the rune for "high danger, high reward" so of course you volunteered. The king has heard of a great obelisk that towers over a ruined city in a far country. He wants to know more about the obelisk and its strange powers. Your job is to find the obelisk and bring back a report to the king. The mission seems absurdly easy...until you reach the jungle. Don't think the king is through with you if you get back to the capital city alive. You haven't seen the last of that jungle yet. Is a share in the spoils of an ancient civilization worth the risk? Don't forget to pack your bug repellent!" "'Come on,' they said, 'It won't be so tough, just stopping a slavery ring,' they said. But you went, and now you're having second thoughts. There were the thieves in the lost crypts of Empyrea, raising hundreds of - no, that's too disturbing to think about. There were the three daughters who - no, that's too painful to remember. 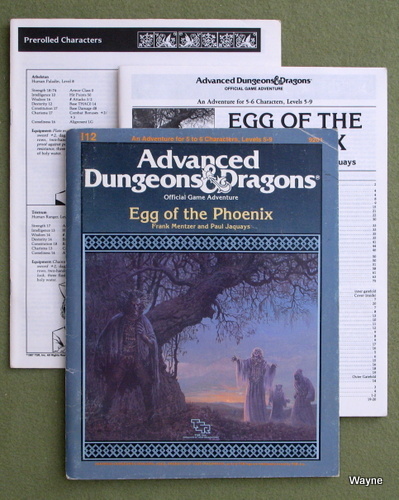 Now there's this Egg of the Phoenix. What does that have to do with anything? This was supposed to be a cut-and-dried stop-the-slavers job. Who said anything about retrieving lost artifacts? Trudging through forests, traipsing through castles, trotting throug dungeons, traveling through other planes: this has turned into more than your run-of-the-mill adventure. The compensation had better be worth it! Provided, of course, you're around at the end to collect your share." "DMs, do you wish you had more time to put together fresh, innovative adventures for your players? Have you ever been stuck for a new plot line, but been unwilling to delve into the reading and preparation required by full-length modules? TSR Inc. proudly presents a new AD&D game accessory designed for the DM who wants variety and challenge for player characters. 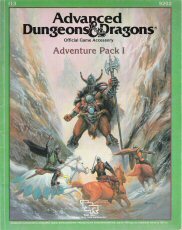 Adventure Pack I contains 12 short modules, each a complete stand-alone adventure. The scenarios are unique and unusual; they will intrigue characters of all levels, and offer a variety of settings and plots for the DM to choose from. These adventures are suitable for one-time play, or can be inserted into your campaign at any time. 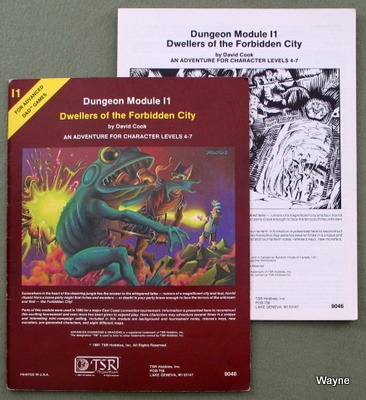 Each module includes one or more maps, background for the DM, NPC capsules, and complete encounter descriptions. The scenarios are designed for a specific range of player character levels, and can easily be made more or less difficult if necessary. Now, with a minimum of preparation, you can give your player characters a challenge that wilt last for as little as one day of game time or months of it. 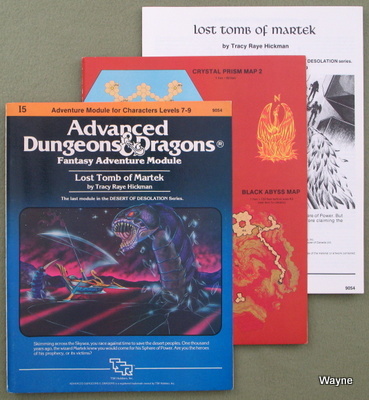 DMs are sure to find Adventure Pack I convenient, innovative, and invaluable!"